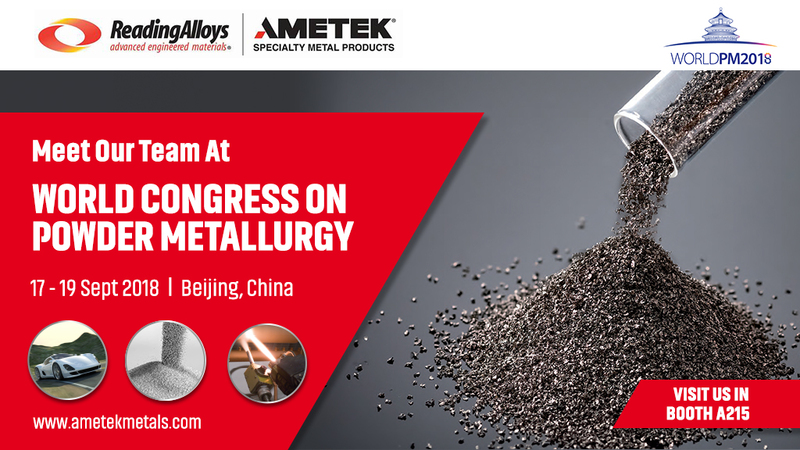 AMETEK SMP Eighty Four and Reading Alloys, both business units of AMETEK Specialty Metal Products (SMP) based in Pennsylvania, USA, will exhibit at the World Conference on Powder Metallurgy in Beijing, from September 17 to 19, 2018. Both businesses have established reputations for their unique flexibility in customizing specialty stainless steels and other high-alloyed metal powders for critical applications that demand the highest purity levels and temperature resistance. AMETEK SMP Eighty Four will highlight its global leadership in the manufacture of advanced stainless steel powders, including the 300 and 400 Series powders that are made to exacting customer requirements. Produced using a proprietary water atomisation process, these powders are used in a range of applications, including thermal spray, brazing, additive manufacturing and metal injection moulding. China is a key market for AMETEK SMP, and, in particular, the Chinese automotive sector, in which AMETEK is a pioneer in the manufacture of higher temperature stainless steel powders for high-performance engine components that demand heat resistance materials. Reading Alloys is a world leading producer of gas-atomized and high-purity titanium powders that are custom-made using a hydride/dehydride (HDH) process and used for a range of critical medical and electronics applications. “China and Asia are important, growing markets. We support the Asian automotive, aviation, and industrial markets with our premium, customized, specialty metal powders. WORLD PM 2018 provides us an excellent opportunity to promote our unique portfolio of titanium and atomized metal powders,” comments Mike Hsieh, Regional Sales Manager Asia, AMETEK Specialty Metal Products. In addition, the event affords AMETEK SMP a great opportunity to introduce recently appointed AMETEK SMP Regional Sales Manager for China, Michael Zhu, who will join Mike Hsieh at Booth A215.